Vision Online is no longer available to use. You will therefore need to re-register for online services where you can request prescriptions and book online. 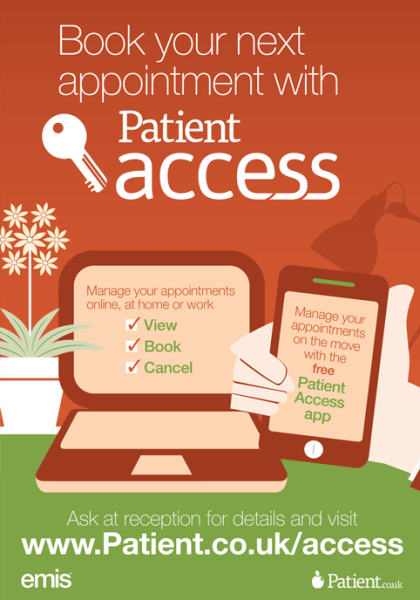 This can be done via https://patient.emisaccess.co.uk/ Alternatively, please speak to reception who will provide you with an on-line registration form. Please be aware you will also need to provide one form of photo id with you when registering at the practice along with your completed registration form. We've been working hard behind the scenes, adding some exciting new features to Patient Access and making it easier for you to use. Our aim remains the same: to help you take control of your healthcare. Whether you're an existing Patient Access user or a new one, just click on the button below to visit our new site where you can sign in, register or read more about new features available. You will need to re-enter your password to sign in to the new Patient Access service so please make sure you have this to hand. If you have not yet registered and would like to do so, please speak to one of our receptionists at your next visit to the surgery and they will provide you with an online registration form to complete. (please bring with you one form of photo id). Registering is quick, easy and your information is secure.